Stan Dziedzic told me an interesting story about Rick Sanders and his battles to make weight. He was from the Randy Lewis school of losing it all in the last few hours.In 1969, when Sanders, along with Fred Fozzard, became the first US world champions, he was having a tough time making 114.5. Larry Kristoff locked him in the sauna, using a screwdriver to jam the door shut. Kristoff forgot about Sanders and went to a movie.He finally remembered and Sanders was not amused. He had enough energy to chase after Kristoff with the screwdriver, but not enough to catch him. My favorite Rick Sanders story was told to me by my 1st college coach, Buck Deadrich. Apparently Rick was wrestling in the finals of the AAU nationals, which were being held in Stillwater (I think, perhaps Edmund,OK) back in the late 60's or early 70's. Buck said that back then, Oklahoma was "the last and tightest notch in the bible belt" and people who looked like Sanders - long hair, shaggy beard, peace button on his jacket, etc, were not fully "appreciated" in OK. Anyway, Rick's opponent in the finals was the great Gene Davis, who was both an OK St. alumn as well as a clean-cut member of the tough Athletes in Action-Campus Crusade for Christ wrestling club. Clearly Gene was coming in as the fan favorite. When it was time for their match, Davis walked out into the spot-light, and the PA annoucer said something to the effect of "Now wrestling in the 114 lb final, wrestling for the Lord- Mr. Gene Davis!" while the crowd cheered long and loud. As the noise died down a bit, but before the PA annoucer could say anything else, Sanders ran out onto the mat, droped to his knees and shouted "...AND WRESTLING FOR THE DEVIL..RICK SANDERS!!!" Buck said there was a slight, stunned pause, before the crowd rained booo's down on Sanders, who promptly pinned Davis in the 1st period! Good story, but there is no way that Gene Davis was wrestling at 114 pounds. Sanders wrestled for a time at 136.5, after he could no longer make 114.5. Behm was at 125.5, so Rick tried 136.5 for awhile. 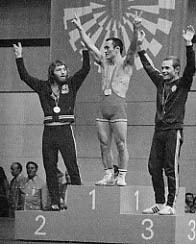 He moved back down to 125.5 for the 1972 Olympics and won a silver medal. Now that I am a couple of months away from the 1/2 century mark, I certainly could be getting some facts/details incorrect, but I am pretty sure I am repeating this story the way Buck told it to me. Of course Buck may have had some of the details wrong as well, but I take him at his word regarding the core facts. One way to get some clarity would be to see if Davis and Sanders ever wrestled in the finals of the AAU or USWF nationals when it was held in OK. Any idea if that matchup ever took place? I am not disagreeing that they wrestled, but it would have been at 136.5, not 114.5. As I noted, Sanders wrestled at that weight for awhile, but went down to 125.5 for the 1972 Olympics. Re: AAU National Championships. All I have access to is the place winners. I don't have the brackets. In what must have been a tremendous upset, Rich Sanders lost to Richie Sofman of U of P in the 1966 championships at 125.5. Sofman was a kid I used to roll around with when I was in HS and Penn was recruiting a buddy of mine and invited us to their practices a lot. in 1970 Sanders won at 125.5 and Davis dnp at any weight. Don't know if they met, but I doubt it. Gene Davis won a time or two after that, but Sanders dnp in his weight class, so I assume they never met. I noticed an old friend of mine, Joe Bavaro of Gettysburg, took 2nd in 1969, losing to Lee Detrick of Michigan, who was the same guy who beat him in the NCAA finals in 1966. Not sure which year it was, but Rich did wrestle Gene in the finals at Oklahoma State at 136.5. I was in the weight and the 3 of us made it to the round robin. In those days we wrestled under the blackmark system. If you accumulated 6 blackmarks you were out. When Rich and I met, I had 4 blackmarks, 3 from an earlier 7-4 loss to Gene. Rich had 3. Ties were allowed, but cost you 2 blackmarks. There was no stalling in freestyle, so Rich's strategy was to wrestle for a tie, knock me out and wrestle Gene in the finals. It worked, except at the end I made a desperation shot and Rich scored on a counter. Rich was by no means a little guy. He had to cut weight to make 136.5. Gene, however, was a very big 136.5 pounder. I do not recall the announcing, but I do recall that Rich wrestled well and beat Gene in the finals. The tournament was the Federation Nationals not the AAU. Rich's weight cutting practices were legendary. At the trials for the Pan Am team in Minnesota a couple of us were running when we came across Rich. He was hiding something in the bushes. I asked him what he was doing and he said he was said Keith you always need a plan for weight cutting. He went on to say the was driving around his route he planned to run hiding cans of beer every 2 miles. He said that could keep him going for 10 to 12 miles and he could lose the 10 plus pounds he needed to lose by the next day. He jumped in his car and went to his next hiding spot. Thanks Brother Keith for the clarification (and the great additional story about Sanders.) That really sounds like Rick from the many stories that Buck would tell about him, on our long van trips back in the 80's. As is the case with many an "urban legend" tale, usually some percentage of the story has been "polished up" a bit in the interest of good storytelling. I always hope that the ones that I hear are mostly true though. Adds to the "That's Incredible!" factor! Thanks again for the clarification. Here's a look at his actual scrapbook. Another where a coach was doing bed check on him and caught Rick with two girls in his bed...the Coach told him when he returned in an hour he wanted "those girls out of here" ...when the coach returned those girls were replaced with two different girls. I did nto know Rick well, but @ the final Olympic Wrestle-offs in 1976 I had a few lbs to cut and was going into the tunnel between the bldgs to run. Rick was also preparing to lose a few lbs or maybe more than a few. He introduced himself and then pulled out a bottle of whisky from his bag and offered me a swig. He said, it is much easier to cut weight if you heat up from both the inside and outside. I declined, but I remember well the battle between Don Behm and Rick for the team. Among the best matches ever! ^^^Some of my favorite Rick Sanders stories were told to me by Oregonian Larry Nugent and Erie (PA) native Tom Canavan, Jr. Here's one from the young Tom Canavan. Rick Sanders was hitch-hiking (or something) one night through Erie County (maybe clinician at summer camp in PA?) and a local sherriff stopped to question him. Story goes that Sanders quickly grappled the sherriff to the ground, disarmed him, left him at the side of the road and drove off in the police car. Thought it was 1972. Rick passed away after 1972 Olympics (RIP), did he not? ^^^Yes, I think Rick got killed in Eastern Europe, hit by a truck while hitch-hiking. I one particularly zany story (told by Wayne Baughman) about Sanders that is a bit too much to post on a public forum. I enjoyed the Rick Sanders stories. He was one of few wrestlers who happened to defeat Dan Gable. I have seen some terrific pictures of Rick Sanders wrestling. I think one of my favorites was the Rick Sanders accidentally kneeling the Asian wrestler's privates while completing ankle pick. Asian wrestler's expression was a funny classic. Can anyone put up the pictures of Rick Sanders wrestling? Tommy Evans the 1968 Olympic coach told me two stories about Rick Sanders. On the flight from the U.S. to Mexico City, Rick ran up and down the aisle of the aircraft with his sweats on to lose weight. In a match in the Olympics, Sanders was declared the loser. Sanders told Tommy, I won this match and I am not leaving until they change the call. Rick said he didn't care if he had to sit there until hell froze over, or words that effect. After about 30 minutes they changed the call Rick was declared the winner, and wound up with a silver medal. I believe it was Anoka, MN .... not that its important anymore. The trials were in Anoka. Were the final wrestle-offs also in Anoka? I don't remember, but I do remember the match between Behm and Sanders. Like the match between Li of N. Korea and Biro of Hungary in the '86 World Championships in Budapest, it sticks in my mind. Perhaps because Behm was so conventional and Sanders was so unorthodox; Sanders so creative and unique and Behm so focused and proficient. Each was intensely competitive, yet regardless of the outcome both would retain the respect for the other. It was unfortunate only one could make the team. To this day, Rick Sanders remains the USA's most unique wrestler (in many ways). Here is the image of Rick Sanders and that Hidekai Yanagida. I got it from Japanese Google. Hidekai Yanagida is two time world champ and a Olympic Champ. First, I want to say hello to an old friend, Keith Lowrance -- haven't seen him in a long long time -- but I used to work out with him about every day in the MSU wrestling room -- and I will say this about him -- he could take me down virtually at will. I have worked out with the best of them -- even Uetake. Nobody was slicker than Keith in my opinion. NObody! More some time later about this as Sanders was NOT my favorite person. Ok -- I'm back -- one more story for now. I frankly, didn't know Sanders at all. I never wrestled after my last match my senior year as I was sort of burned out IMO. Anyway, my junior year I wrestled very hard in the finals to beat Sanders' teammate -- Yatabe. Right after the match, while I'm still on the side of the mat, Sanders comes up and starts calling me names I've never heard before -- and in between explaining to me all the reasons I'm not fit to carry Yatabe's jock. Frankly, I've rarely encountered less class, even from wrestlers. I tried to ignore him, as I recall, but he followed me all the way to the commentator (I think Frank Gifford?) harrassing me all the way. I was close to going after him -- and it wouldn't have been a wrestling match -- he really ticked me off. So that was my only experience with Sanders. The next year when I beat Yatabe in the finals, Sanders got beat (by Keller), so he was probably out drinking by the time my match rolled around -- lucky me. So -- Sanders is not my favorite person. DAA interesting - there is no doubt that Sanders was a jerk and drove USA national team coaches nuts, but he sure could wrestle. Thanks for the kind words. You were always a good friend and great teammate. Your ability to perform in matches was matchless. One of the things that I ( and Dale Carr) were always proud of was that we taught you the Granby and you used it 3 times against Yatabe. I loved the thread you had going on the old forum about coaches etc. I should have jumped in, I have some good stories ones too. It is interesting you brought Uetake's name up. He and I are good friends. The friendship started at the World training camp in 1966 at U of Michigan. Basically we got in a major fight after I took him down 3 straight times( he claims it was the only time he was ever taken down, I think he meant by an American). He punched me and I tore into him and knocked him down. Myron Roderick and Doug Blubaugh pulled us apart. We wrestled everyday for about 10 days, I definitely held my own. Stan, I remember the 72 trials well. I agree, the match between Donnie and Rich at 125.5 was as good as any match I've ever seen. They were both wrestling with the Gold Medal in mind. Both had previously won Silver. Donnie was my teammate for 3 years at MSU. We worked out everyday. Keith -- Thanks -- esp about your comment about your match with Uetake. It might surprise others -- but not me. I was sad that neither you or Don won a championship -- you were both better than me. I think I heard you took Gable down too. Uetake was of course much better than Dan on his feet -- just not as intense. I think Gable (and I) got that from the West High wrestling room. Love hearing these stories of workouts and honest thoughts of competitors.